GNLW553 with 550mm diamter bowl and 1800mm bowl length. Derrick DE-7200 VFD with 544mm big bowl and 1829 bowl length. NOV Brandt HS-2172 with 533mm big bowl and 1829 bowl length. More about GNLW553 big bowl big volume centrifuge specifications. Remarks For fixed speed centrifuge,GN have other speed available for your optionby using different pulley,please specify your required speed. The DE-7200 Variable Frequency Drive (VFD) centrifuge offers the high flexibility in system control, permitting it to handle a wide range of feed slurries. Its automatic startup and shutdown routines permit safe, consistent, unattended operation. Automatic load sensing and feed pump control facilitate automated performance optimization. The bowl can be operated at up to 3000 RPM, resulting in centrifugal acceleration of 2750 G’s. To accommodate low levels of agitation and rapid solids removal, the conveyor can operate at differential speeds ranging from 1 to 70 RPM. 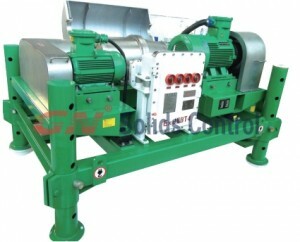 The DE-7200 drive system consists of two explosion-proof inverter-duty motors. A 150 HP motor drives the bowl, and a 60 HP motor operates the conveyor. Motors are powered by Pulse Width Modulated (PWM) AC drives having Insulated Gate Bipolar Transistor (IGBT) outputs. Each motor drive and peripherals are controlled by an environmentally hardened PLC, which offers operating flexibility, short-term data storage and display of critical parameters, and remote monitoring and control of the centrifuge from up to thousands of miles away. Some more info about MI Swaco Big Bowl Big Volume Centrifuge.